Ages: Children under 14 must be accompanied by adult. Retreat to the Pool and Lounge Vdara for a euphoric escape. Enjoy private cabanas poolside and indulge in made to order cocktails and personalized tapas tiffin-style. Cold salads, hot sliders and chilled cocktails can all be enjoyed poolside. 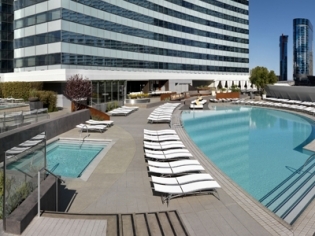 Enjoy the hot sun and the cool pool while relaxing among the City Center rooftops. The menu offers traditional yet healthy options in a gourmet fresh style. Be sure to call the concierge for opening hours as the cafe is open only seasonally with the pool area. Additional Information: Spa cabanas, daybeds and pool cabanas are available with extraordinary amenities. Spa treatments are priced separately from the cabana rental fee.